These came out around the start of March but I've only just got them. 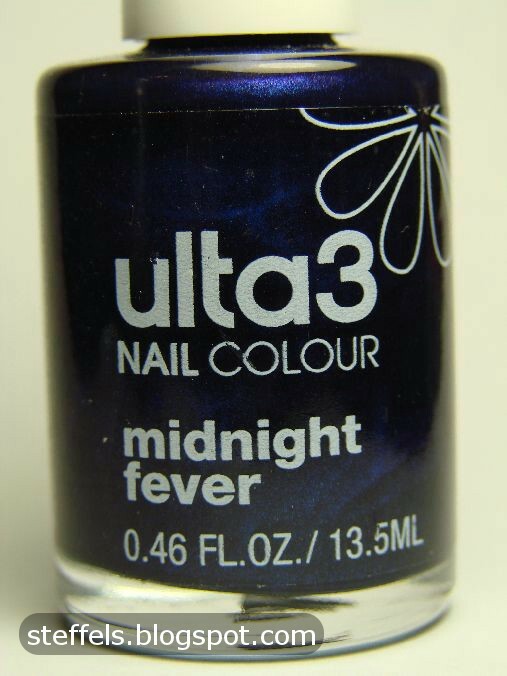 I didn't know Ulta3 collections had names until I did a quick Google and their media release came up labelling this as the Floral Fever collection which makes sense since all the names have 'fever' in them..
Kinda random colour choices right? Blossom Fever. Light peachy pink with hidden red shimmer. The shimmer is very subtle - almost invisible. 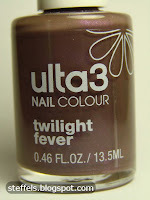 It does at interest to an otherwise pretty "regular" shade. This is three coats. It was a little uneven but ok overall. 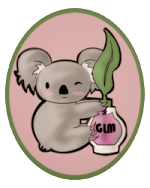 I don't think this one works with my skin tone very well. 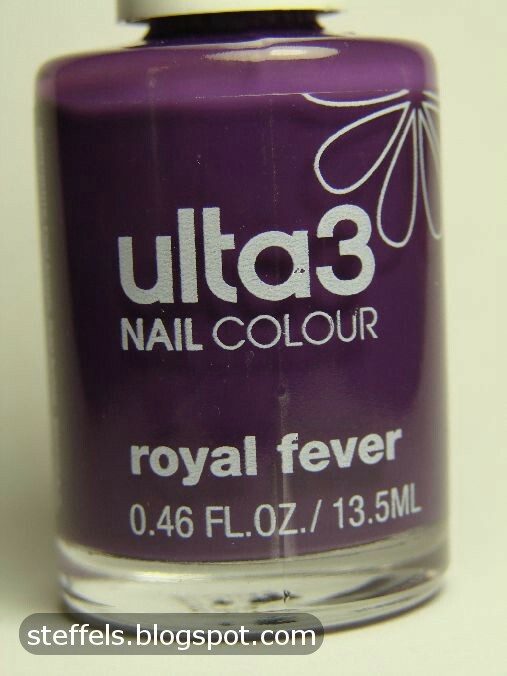 Royal Fever. 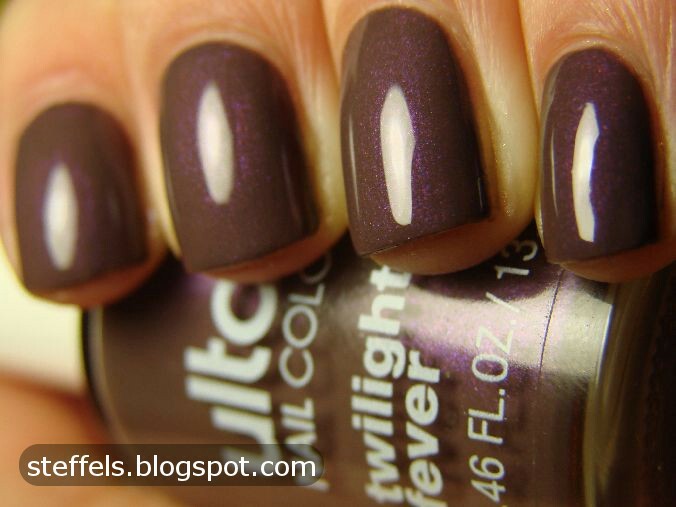 Dark purple creme. Really nice formula - 2 coats. I have quite a few dark purple cremes. I love them. This one leans more red than most of the others I have. Pacific Fever. IMO, the star of the collection. Bright turquoise with lots of blue microglitter. So beautiful. This isn't the type of colour you'd usually see in an Autumn/Winter collection but I'm not complaining.This was two coats. Midnight Fever. Two coats. 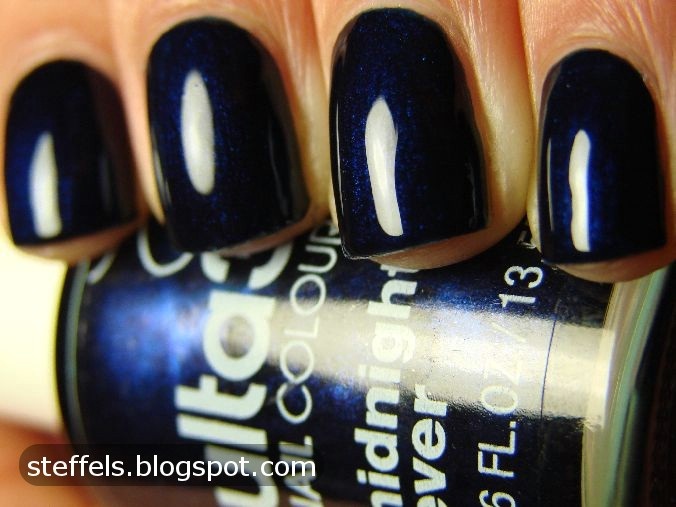 Really, really dark navy with a bright blue shimmer. This is one of those colours that look pretty much black in most lightings. Under sun or bright light though, the shimmer really comes through. It's deep, dark and dramatic. I like it! 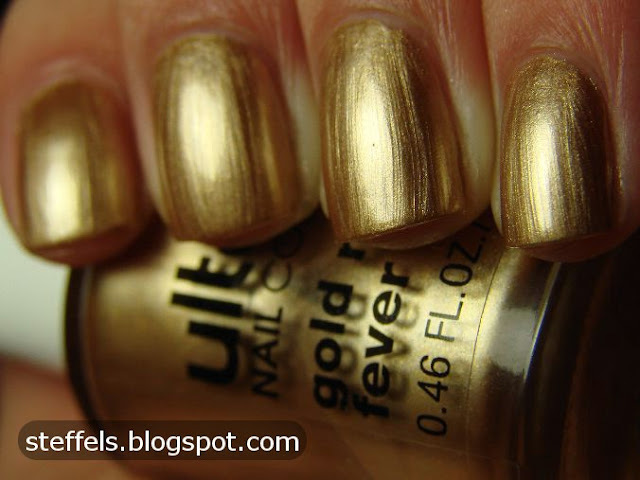 Gold Rush Fever. Ahh... here we have my least favourite. Gold frost. Really frosty frost. I hate frost. Just look at all those brush strokes. 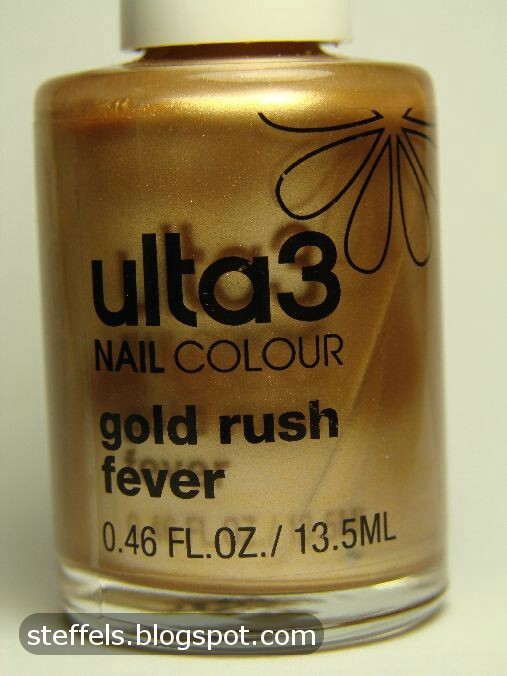 Plus, this shade of gold looked decidedly bad with my skin tone. 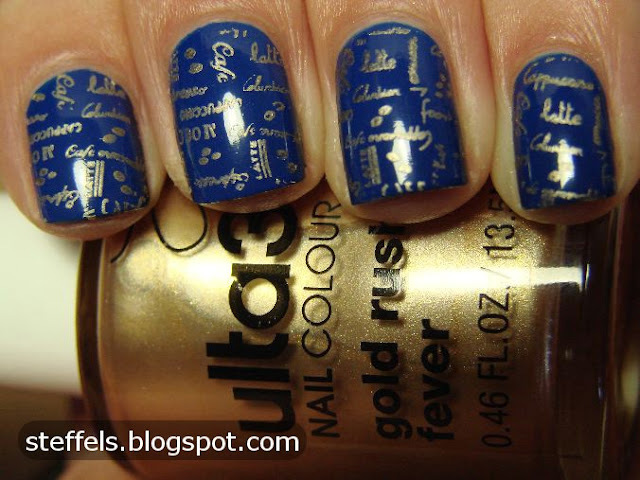 The only saving grace for this polish? It konads really well. You can probably tell by my the crappy alignment that I rarely pull out the konad (I am excited about the new BM plates though). This is konaded with plate HB24 on The Face Shop BL605 which is a gorgeous blue. 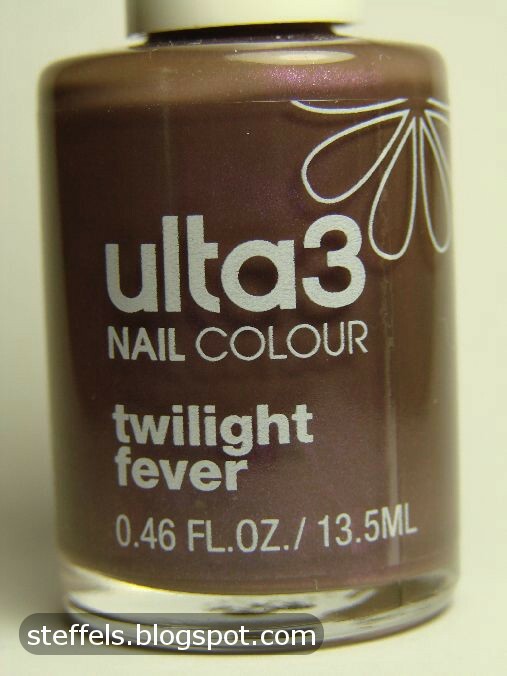 Twilight Fever. Another Paradoxal dupe. Everybody's done one. Still a great colour though. The formula was nice - 2 coats. Why haven't I seen your blog before? You're amazing! I think I'm falling in love with your pictures. You can make a streaky frosty gold mess look good. Thanks hun! I'm flattered you think so! I just subscribed. Great polishes and great swatches. I love the konading in gold you did. Which p plate is that?